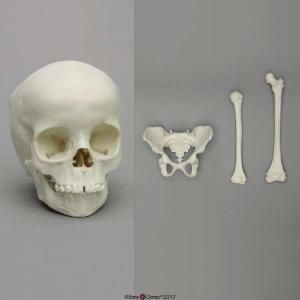 Each set features a skull, pelvis, humerus, and femur cast from actual remains. Choose between the remains of a modern day youth or the skeletal remains of an asian male. Either makes a great addition to our Sherlock Bones activity. Neither are referenced in the lab, so students will not have a reference to go back to. Sets are prepared to an Economy level. Cast from the same molds as the regular Bone Clones® skull and postcranial parts but cranial nerve passages and postcranial foramina are undrilled. 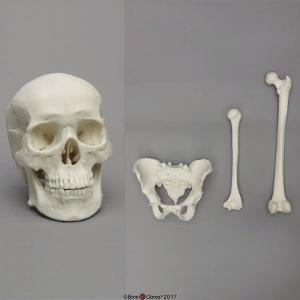 The teeth color in the economy versions are the same color (same resin) as the rest of the skull, which is a natural bone color.